21st Century skills, including technical and career readiness. Critical thinking skills, including the abitlity to create, analyze, and evaluate. Academic proficiency, including achievements in both the classroom and on high-stakes assessments. Effective communication skills, including the capability to collaborate. Our mission at Centennial is to provide programs and services to allow ALL students to graduate from high school prepared to succeed in the workplace or at the post-secondary level. As a staff, we are committed to reinforce the goal of our students to be HAWKS = Honest – Ambitious – Well-rounded – Kind – and Spirited. 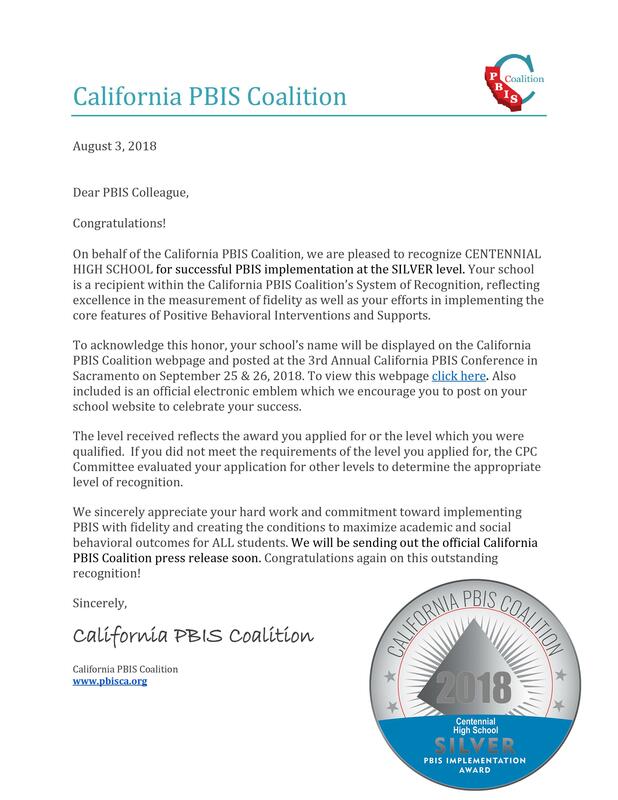 Recognized as a California Distinguished School. Individual state Forensics champion in 2013 and 2014. Double “AA” Sweepstakes State Forensics Champions in 2010. Also, two individual state champions in 2010. Top finisher in San Joaquin Valley at 2013 state championships. High student performance with approximately 54% of students qualifying for honor roll with a 3.0 GPA or better. Marching Hawk & Golden Pageantry Corp. have won numerous sweepstakes awards in statewide competitions. Wide variety of excellent academic support programs for underserved and challenged students – Literacy, ACCESS, Foundational Math, Academic Achievement, CAHSEE classes, Student Tutors, and Career Choices curriculum. CHS Fascinating Facts 10.2016 pdf handout.